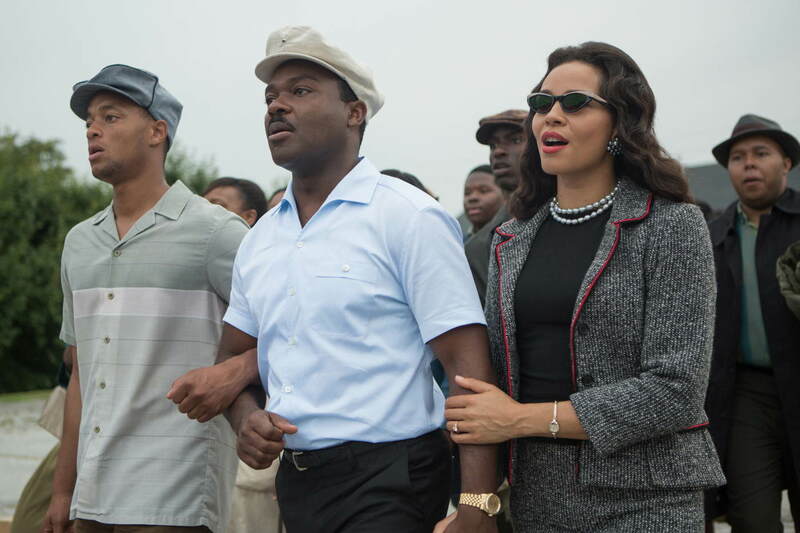 David Oyelowo and Carmen Ejogo star in “Selma.” Photo Credit: Paramount Pictures. Polished and poignant, the true story of Dr. Martin Luther King Jr. leading the perilous movement to pass equal voting rights is a must-see. The dramatic biopic Selma directed by Ava DuVernay (Middle of Nowhere, 2012) captures Dr. King’s months-long struggle in 1965 to promote awareness by way of peaceful protest. He was determined to get the issue in front of President Lyndon B. Johnson and prompt change. As each day passed, brutal violence in opposition amplified, but Dr. King still refused to retaliate. No matter if you lived to experience this point in history, or you studied it in school, the film is sure to captivate. Shot on location, its most influential scenes illustrate the landmark marches led by Dr. King, which occurred over five days from Selma to Montgomery, Alabama where Southern populist Governor George Wallace resided. “Bloody Sunday,” the confrontation between marchers and Selma police on the Edmund Pettus Bridge, is also depicted, and with brutal force. David Oyelowo’s (Lee Daniel’s The Butler, 2013) performance as Dr. King is fascinating. His concerned and scared, yet calm and collect demeanor is spot on. We see him as a hero and as a human as he and his wife Carmen Ejogo (The Purge Anarchy, 2014) fight to save their marriage. The inflection in his voice and the pace in which he preaches is strikingly familiar. The film features other notable performances, including Oprah Winfrey’s (Lee Daniels’ The Butler) as Annie Lee Cooper, a protester who was denied her right to vote, Cuba Gooding Jr. as Fred Gray, Tom Wilkinson as LBJ and Tim Roth as Governor George Wallace. The screenplay by Paul Webb depicts the disturbing racism and violence toward blacks and even whites who supported Dr. King’s movement. In one scene, a white Catholic priest and a minister are brutally attacked by southern bigots. Audiences are granted a backstage pass to moments of historical importance, including discussions and decision making in the Oval Office. Eventually, the memorable march from Selma to Montgomery would encourage President Johnson to sign the Voting Rights Act of 1965, one of the most important triumphs in civil rights history. Understandably, the film strived to mirror the actual history, but the film dragged toward the middle. Overall, however, it was a captivating portrayal of the human-side of Dr. King. DuVernay’s close to home relation to the story shows in her sensitive direction. Her father lived in Montgomery at the time and witnessed Dr. Martin Luther King’s historic five-day march from Selma to Montgomery. DuVernay’s work in Selma has granted her quite an honor. She is the first black female director to be nominated for a Golden Globe Award. I remember listening to her incredibly emotional speech at Roger Ebert’s tribute ceremony in 2013. As a young girl, DuVernay recalled being star struck by Ebert’s presence and humbled by his taking notice of her. She greatly admired him and attributed much of her continued passion and success to Ebert’s inspiration. If Ebert were still with us today, I’d wager to bet that he’d be holding ‘two thumbs up’ for Selma. Bottom-Line? This true story recounts the tumultuous year of 1965, when Dr. Martin Luther King, Jr. led the courageous movement to pass equal voting rights while facing violent resistance. Selma couldn’t come at a better time following the coat tails of the recent outrage and protest in Ferguson, Missouri and New York City. This wonderfully acted film is a modern day reminder that racial problems still exist and progress is still needed.